My Kyäni Review: A Good Choice Or More Of The Same? A nutrition-based MLM that has a surprisingly small selection of products and a large amount of hype. In many ways, Kyäni is just like dozens of other MLMs. In terms of products, the company has a fairly small selection of nutritional items but they all tend to be overpriced and offer few advantages over standard supplements. At the same time, the compensation plan is nothing to get excited about and has a strong focus on recruitment. Coupled with the fact that the company has been around a while, these aspects suggest that making money with the company would be much more difficult than the company itself implies. Like many similar companies out there, Kyäni is strongly based on health and nutrition. That's pretty common right now and it seems to be happening because there are so many people in society who want to get better, lose weight and get healthier. Plus, it’s hard to go wrong with nutrition products, as most of the time people can’t really tell if those products are actually working anyway. The first of the products that the company offers is called Kyäni Sunrise. This is marketed as a ‘nutrition and antioxidant powerhouse’ and is something that people are supposed to take first thing in the morning, every day. In addition to that, there is also a variety of vitamins and minerals that have been added in. The end result might sound great but you could get most of the same benefits simply by eating a healthy diet which includes berries and vegetables. Likewise, the benefits of antioxidants tend to be exaggerated and there is even some evidence that too many antioxidants may be harmful to health. Realistically, no supplement in the world could ever replace the benefits of a healthy diet and that includes this one from Kyäni. Besides that, that $85 price tag is for 30 packets, which is supposed to be a month’s supply. That makes the product pretty expensive. 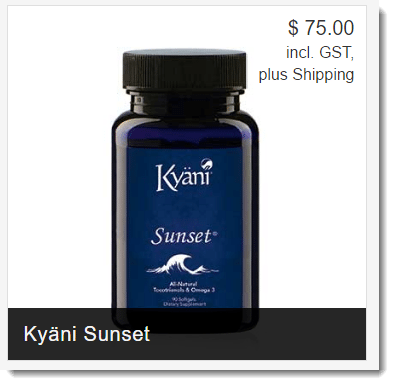 Another product the company offers is Kyäni Sunset. This one is a vitamin supplement, which includes vitamin A, vitamin D and omega-3 from fish oil. Once again, those vitamins are best sourced from your food, if possible. But, if you wanted to take them in supplement form, this is an expensive way to do it, especially as all the components are common supplements. 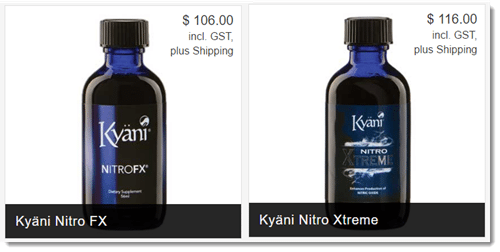 Kyäni actually has an extremely small product line, so there is just one other set of products to mention, which is the Nitro family. This consists of two products, Nitro FX and Nitro Xtreme. In both cases, the products focus on nitric oxide from Noni juice. The company actually doesn’t specify anything more about the ingredients. Personally, I’m extremely skeptical about these products. The site talks about how nitric oxide is abundant and must be renewed constantly, even going so far as to point out that it has been called the ‘molecule of life’. Be that as it may, none of the information that the company gives offers any evidence that supplementing with this product is going to help your health. This stuff is starting to sound very pseudo-science-y. In fact, there is no evidence that any of these products are going to improve health. Realistically, they are just expensive supplements that will probably have little to no effect. At the same time, most nutrition MLMs take a pretty similar approach and many offer at least one product that is supposed to be revolutionary. So, despite all of the hype, these products aren’t really that special. When it comes to the opportunity, the best place to start looking is just at the process of selling products. With Kyäni, distributors earn the difference between the retail price for the product and how much the distributor would have paid, along with a percentage. This calculates out to around 20% to 30% commission. However, the company provides all of this information in CV (which stands for Commission Value, I assume) and that makes it harder for distributors to calculate out. The image below is one example of the calculation given on a site explaining the compensation plan. To me, this complexity is a perfect example of why MLMs are so tricky. It seems like every area within a commission scheme, including the one for Kyäni, is simply far more complex than it needs to be. Now, with an MLM, the emphasis is never actually on selling products. In theory, you can make money this way but to do so you’d have to sell an extremely high amount of products. Instead, the emphasis is on recruitment (which is where the name MLM comes from). So, you recruit people, then they recruit people, and so on. Visually this ends up looking exactly like a pyramid scheme, although technically it isn’t, because there are legitimate products involved. As your team (or downline) gets larger and more successful, the amount that you can earn increases. For example, you can earn some commissions from other people in your downline, likewise, there are bonuses for meeting specific goals and for various levels of success. In fact, you can get all the way to earning commissions from 9 generations into your downline. That sounds huge and if you could get there, the commissions would be high. But, that’s the catch. If you can get there. 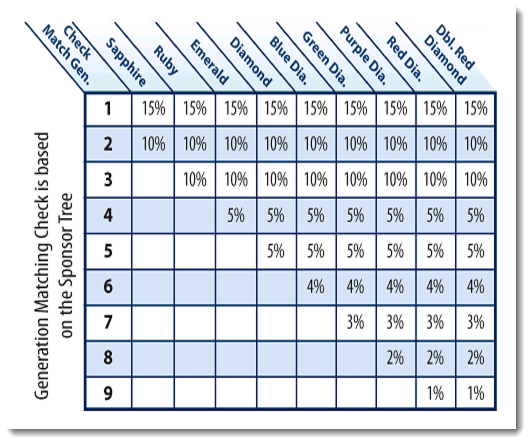 Each rank has its own set of requirements, including the need for your downline to reach a certain amount of sales. If you’re lucky, you might be able to reach the first or second rank but for most people that would be as far as you go. I know I sound pessimistic but the entire MLM system assumes that you can recruit people with relative ease and that you (and those in your team) can consistently make high volumes of sales. How likely is that? I mean, there is already a huge amount of nutritional supplements currently on the market and you have to compete with them. Plus, the MLM design actually suffers from one of the key issues that pyramid schemes suffer from. This is the fact that recruitment works best when the company is new. The larger the company gets, the harder recruitment is. How big is your network of friends and when do their network of friends start to impede your team growth? From looking at the commission plan for Kyäni, my biggest takeaway is simply that this is the same sort of thing that you find in just about any MLM. Yes, it’s possible to make money but you can’t make a decent income without getting involved in the recruitment side of things. Even then, making a decent income is much harder than the company implies. If you don't do recruitment, you're just a salesman. If you just buy it for discounts, then you're a customer not a business owner. It can be challenging to make money in an MLM at the best of times, and it’s getting increasingly more difficult for any health or nutrition product to stand out. Selling products that are based on outlandish claims or dubious health effects is not where I would start. Regardless of your approach, making money is hard work, I’m not disputing that. However, the MLM model is still considerably more complicated than it needs to be. Yes, some people make great successes in the industry, but most people fail. If you’re looking for a way to make money, a more reliable approach is to rely on product sales rather than recruitment. After all, people tend to buy products a lot more often than they join companies to sell stuff. So, you have a much better chance of making sales. To a degree, you can do this in a company like Kyäni. However, the model strongly emphasizes making money through recruitment, so you’re always going to be limited. So, why not find a better model. That’s what affiliate marketing is. It’s an entirely different way of making money and the emphasis is entirely on sales. At the same time, you actually get to be in control of what you sell, so you can pick products that people will actually purchase. You might even say that affiliate marketing is the opposite of an MLM. There is no complex model, no need for recruitment, you are the one in control and you don’t have to sell physical products. In fact, you don’t even have to sell directly to people. Instead, you use a website to make sales, which also makes it much easier to scale the business up and make more money. Websites are online 24/7, and you can only throw so many networking parties in your spare time, right? 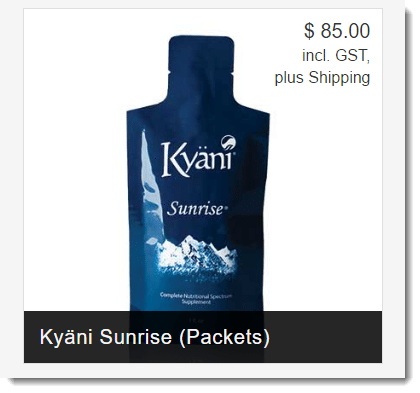 I had recently suffered from a stroke, which had affected my mobility somewhat, so he suggested I try Kyani. He didn’t represent himself as a salesman for the product but told me his aging father had derived a great deal of benefit from it. I said ‘sure, I’ll give it a try’. Next thing I know, I’ve been invited to a meeting for Kyani missionaries, and they’re talking about white luxury cars, millions of dollars, and the structure of their company. Oh yeah…they also talked about the efficacy of their product line. I told them I’d try their stuff for a month (I had been using their product for almost two weeks, and had seen no verifiable improvement, but had been told to give it a month.). I received my monthly shipment two weeks later, and three weeks into it, guess what? I got my following month’s worth of product. It took me almost a week of long distance calls, angry emails, and $35 of my money to ship this stuff back to the States to have them reimburse y credit card. I found this MLM lacking in terms of customer service, and disingenuous about their terms of service. Just eat a healthy diet, purchase your vitamin supplements from your local pharmacy, and get some exercise. Kyani is just another in a long line of over hyped nutritional supplements whose leadership concentrates more on potential profits than delivering a product that provides real and noticeable healing powers.